From the Zone Summary screen touch the zone you wish to view. 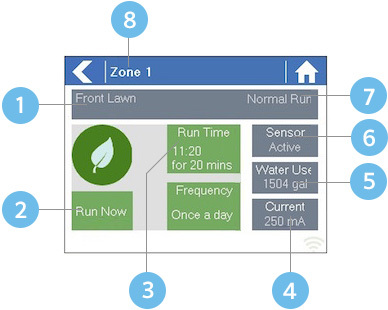 Sensor: The current sensor state if configured in the Hydrawise app. Water Usage: Water usage for this zone run. This is only shown if you have a flow meter installed and the zone is currently running. Current: Indicates the current that all solenoids are using (including a master solenoid if configured). Generally speaking, this value ranges from 200mA to 600mA depending on the number of solenoids attached to a single zone output. The controller has a built in fail-safe to automatically stop your zone if more than approximately 800mA is detected as this may indicate a faulty solenoid or wiring. The Zone Status screen also allows you to manually start a zone using the Run Now button. When started, the zone will run for the zone’s default configured run length. This can be overridden by clicking on Run Time prior to manually starting the zone. When a zone is running the Run Now button will change to Stop, allowing you to stop a running zone.